let’s continue with more detailed coverage of the novelties from SIHH 2019 from Girard-Perregaux. 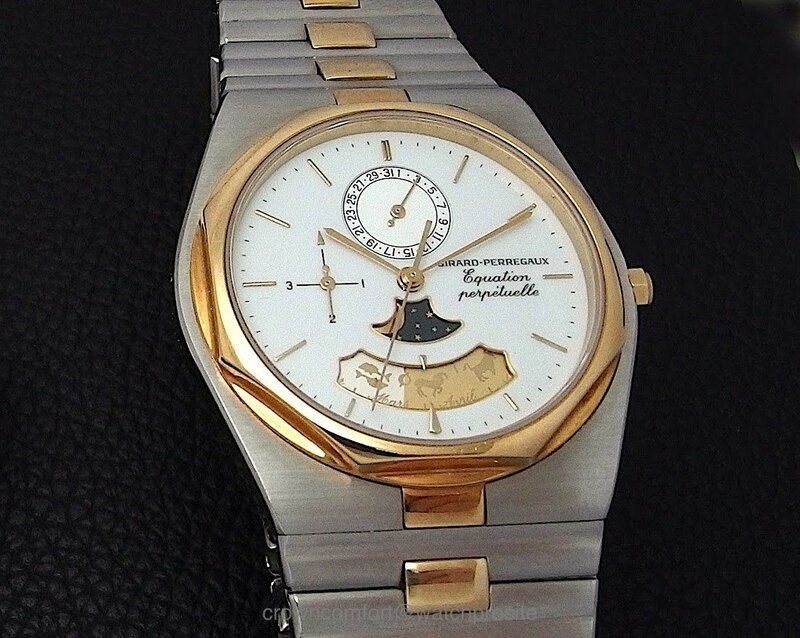 This time, we will look at the Girard-Perregaux Laureato Perpetual Calendar, Ref 81035. Ok, technically, this watch has not been released at SIHH but a few weeks earlier already, but I still consider it a 2019 novelty and as I have seen it first time at SIHH, I’ll review it here now. Watch enthusiasts familiar with GP will not be surprised by the asymmetrical layout of the Perpetual Calendar on this new Laureato and will surely have seen it before. 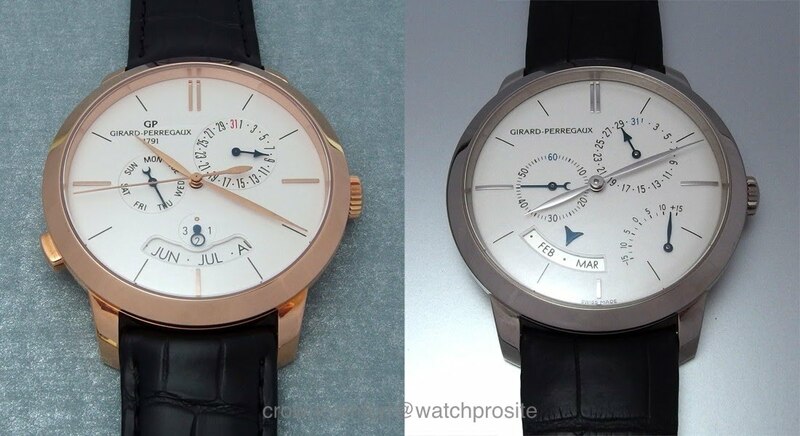 The 1966 line has currently a perpetual calendar with the same layout but in a much dressier case and if you follow WPS you also surely know my 1966 Equation of Time with Annual Calendar, which has a similar dial layout. We already saw last year the addition of the Chronograph complication to the Laureato and now with the Perpetual Calendar, we also have a true Haute Horlogerie complication. Of course, we also have for a while the Tourbillons in the Laureato but some WatchPuristS call that a “sophistication” rather than a “complication”. Furthermore, in the history of the Laureato, it actually is not the first Perpetual Calendar. GP already had a Laureato Perpetual Calendar in the collection back in the 80s with the second generation of Laureatos. The interesting point here is that this model also used an arched window to display the month (and zodiac) with a rotating disc. A great link back to history, I think. There was of course also a Laureato Evo3 Perperual Calendar Chronograph, but this one looked very different as it was dominated by the Chronograph look. Either way, the Laureato Perpetual Calendar provides a fresh look to a by now well-known watch. That fresh look comes from the fine attention to detail GP is known for. 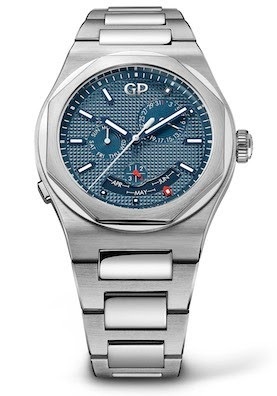 With the Laureato being a sports chic watch and the dial featuring the compulsory Clous-de-Paris pattern, GP did well to add some fresh details to the dial and hands. There are the two round subdials for day and date. They have a fine circular pattern that contrast nicely with the hobnail of the rest of the dial. Especially when moving the watch in light, it provides a great visibility and is a great detail. The large rotating month disc is like on the 1966 displayed in an open arch window, however, here the month indicator does not sit central at 6 o’clock but is moved to the index at 5 to underline the asymmetrical theme. And GP has used red colour to freshen up the look. The 5 index is red and doubles up as month indicator. The disc is rotating clockwise so we can see more text of the passed months and you can always easily read the current month. The tiny stubby leap year hand is also painted in red as is the leap year number 4. But something is strange here…look again at the leap year indicator of the 1966 Perpetual: On top you have the Leap Year (4) and then clockwise you go 1,2,3 so the hand rotates clockwise. But now look at the Laureato: in a clockwise direction, you have 1,2,4,3. So the year hand must jump 180 degrees from 2 to 3 and again from 4 to 1? Interesting and I actually need to confirm the mechanism, so stay tuned. Finally, the date indicator for 1 is also painted in red as an added spice. But there is something else different and interesting…have you noticed? GP has been very sparse with text on the dial. 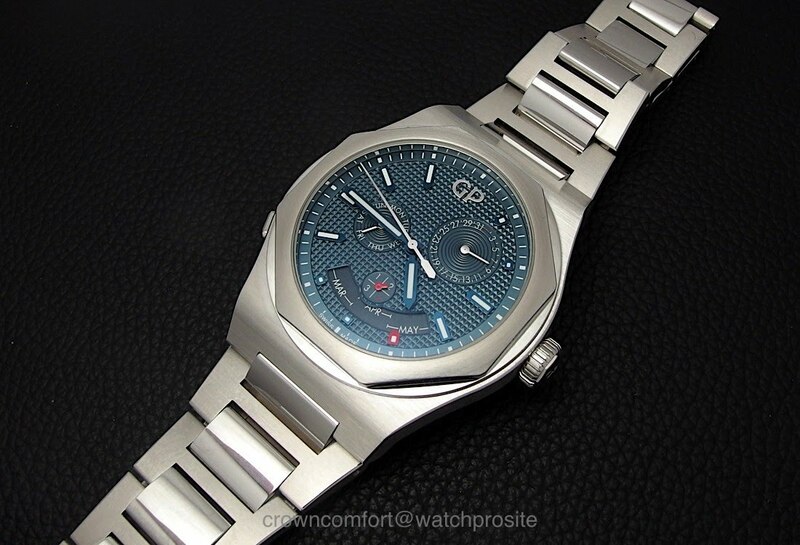 Unlike other Laureato models, you only have the applied “GP” logo at twelve. 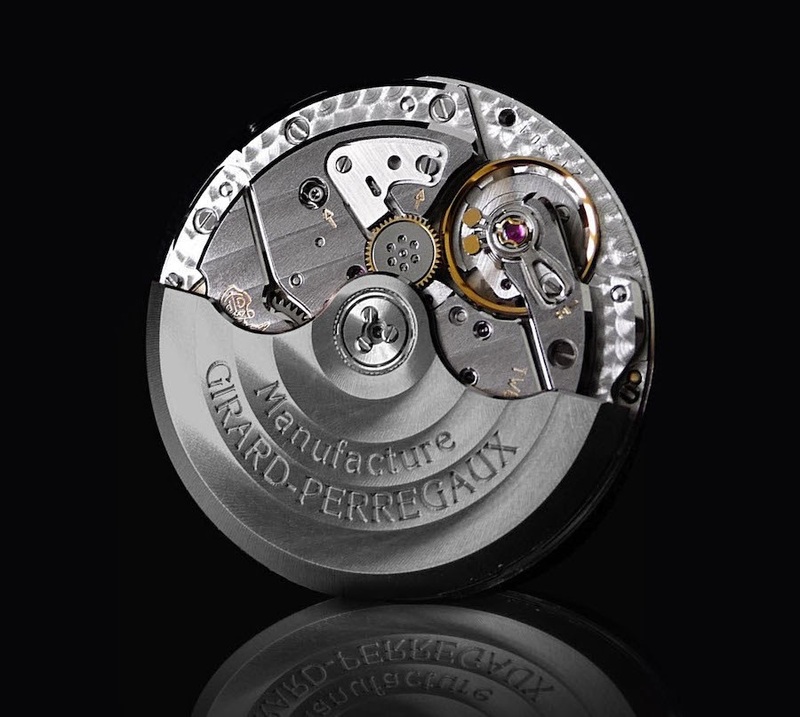 No “Girard-Perregaux”, no “automatic”, no “Laureato”, no “1791” on the dial. Of course, the calendar complication takes a lot of dial real estate, but still, I think this is a great decision to keep the text away. Before we look at the case and movement, one more observation from my side. Not exactly a point of critique but an observation. I’m a little bit disturbed by the large central running seconds hand. 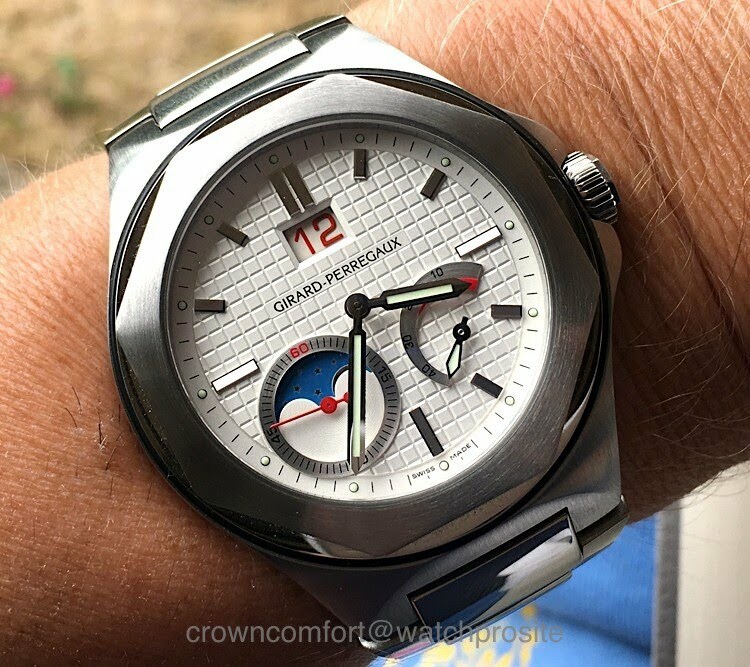 Other manufacturers have chosen to leave the seconds hand off on the perpetual calendars to not disturb the look of the calendar and I feel that could have been a good option here as well. On the other hand, I always struggle a bit with watches without visible action dial-side. The 1966 Annual Calendar resolves that nicely with a small seconds, but the Perpetual Calendar needs a Day indicator to be complete so that space was not available. Not sure what would have been better, it is certainly up for debate. 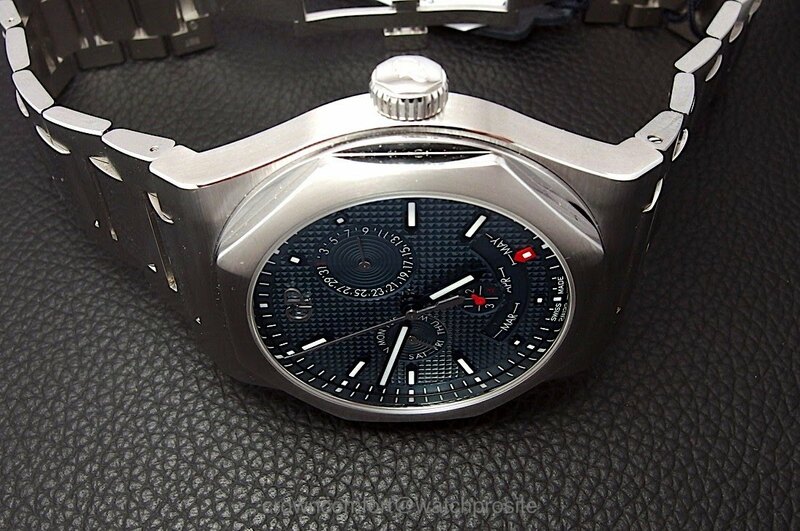 Looking now at the movement, we actually see a new development under the hood of the Laureato Perpetual. Yes, the calendar mechanism has evolved from the Annual Calendar and Perpetual Calendar 1966, but this time is built on top of the larger automatic calibre GP01800. It can be seen through the see-through case back, but pretty much looks like the one deployed in the time-only 42mm Laureato. It has a total of 46 jewels and is a full inhouse movement. 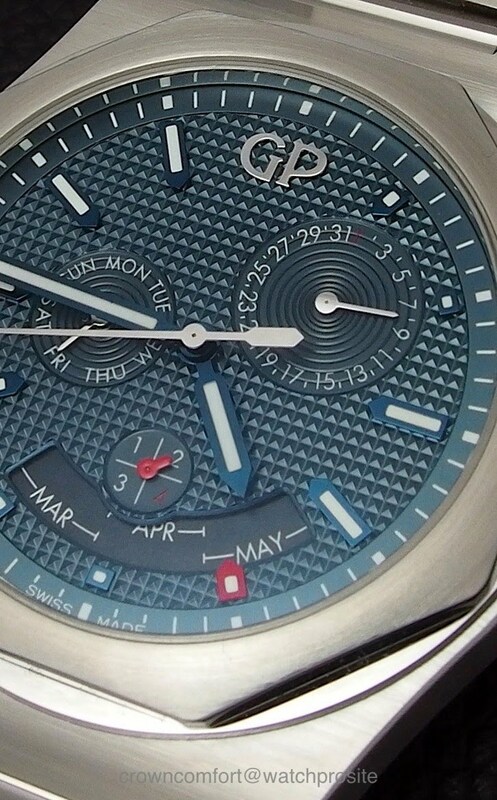 What is quite special about the GP Perpetual Calendar module is how it is set. One of the things that many people make them stay away from Perpetual Calendars is the fact that they need to be set in a “complicated” way every time you take the watch out of the safe or box. Of course, you can keep it running on a winder, but I usually prefer my watches to rest when not used and winders do take a lot of space as well. The mechanism here is quite cunning. Unlike other Perpetuals, there is no need for correction pushers (I will get to the pusher at 8 in a minute) as the calendar can be set via the crown backwards and forwards by simply moving the date hand. The month disc will adjust automatically as will the leap year. Now you could argue that worst case you need to turn the date a full 2 years, but for one that is actually done relatively quickly and for two, in practical terms you maybe have your watch rested for a few weeks and then the adjustment literally only takes seconds and the calendar is set again. The pusher at 8 is only setting the day, independently from the calendar mechanism. Is it good that GP used a pusher instead of a correction pin? I think aesthetically, the pusher wins, not sure if it is protected from accidental operation, but I guess that’s a minor point. What I would have liked to see on the other hand would have been a gold rotor instead of the steel. I think the cost of gold at this price range would not have made a difference and a gold rotor would have looked better and more valuable for a Haute Horlogerie piece. Or putting a solid case back on it would have also worked. The case and the bracelet are well-known from the Laureato line. You have the 42mm case size which for me is perfect on a man’s wrist. The bracelet is superb quality and very smooth. Where is still room for improvement is on the clasp. Double-folding mechanism, secured by pushers, but as the pushers sit on the clasp and not inside the bracelet links they are close to the skin and can sometimes accidentally release if the bracelet sits tight. I also think that all bracelets should have an easy micro-adjustment. Not only that one full link often leaves you with either too wide or too tight fit, wrist size also varies over the day and a quick micro-adjust as you have for example on the Sea Hawk III bracelets would have been the ideal solution. 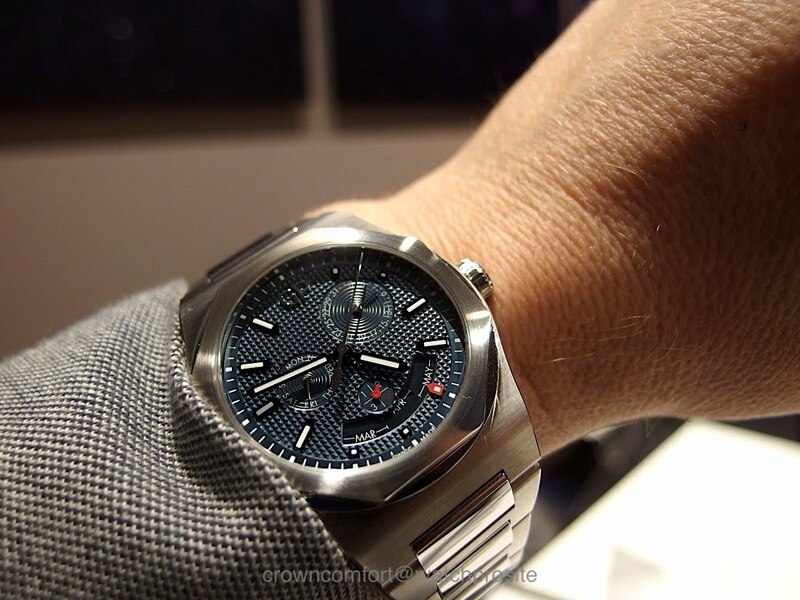 I must admit that I was a bit sceptical on the release if a perpetual calendar is fitting into a Laureato, but combining an interesting Haute Horlogerie complication with the stylish and casual look of the Laureato is actually really appealing to me. The case is comfortably thin and the bracelet very smooth as we know already. What really strikes me though is the asymmetrical dial layout, the touches of red and the superbly thought through perpetual calendar mechanism with its easy setting and unique look. Of course, there is the significantly higher price a complication like a Perpetual Calendar demands when compared for example with the Chronograph, but then you also get something very special for it. I would have certainly wished for a solid gold rotor or alternatively a nice solid case back. I also think GP is well advised to keep the Laureato Perpetual as one version, no need for other dial colours, gold or black case versions. There are already a lot of models within the Laureato family, the Perpetual Calendar is one of the finest among them and doesn’t need a further diversification in my view. If I would only get one modern Laureato and budget would be no problem, I would indeed choose the Perpetual Calendar. 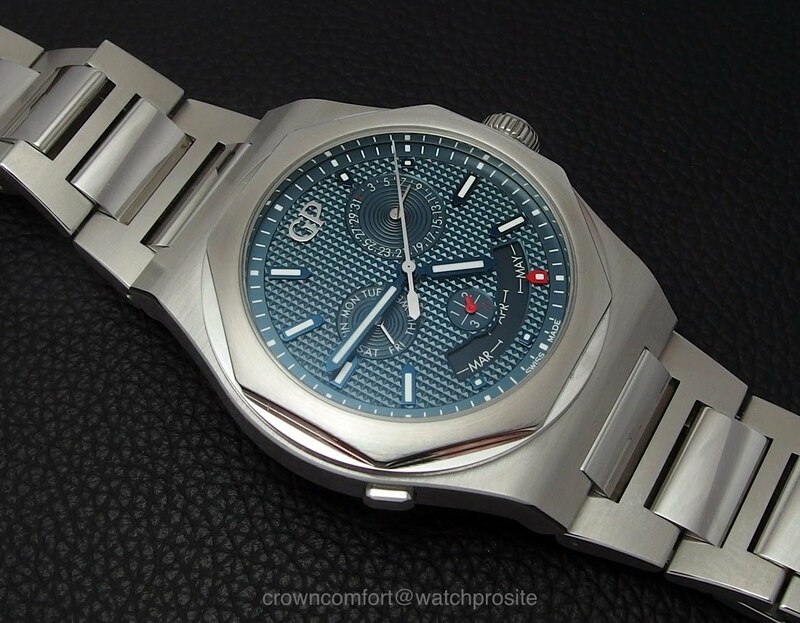 I think it would also compliment well my Laureato Evo3 Large Date / Moon Phase with white dial. So, congratulations to GP for nailing this one right on the head. A few small tweaks if I had a saying and it would be close to perfection! Great review, CC. I love the different finishes on the dial surfaces. But I do find it interesting that you would pick a PC Laureato of all of them. Never took you for a PC lover. Besides, your EoT is still the coolest. Well, I can sometimes surprise myself I think the ease of setting this PC is a big plus, it works just like the 1966 EoT. So the 1966 for formal and the Laureato for casual...I think that's a great pair. Funny, but I like when there is something with the Laureato: A Grande Date Moon Phase, A Tourbillon with bridges, a Perpetual Calendar, much more than when it is a time only. No, indeed. Especially when you compare the Chrono with the two pieces you posted, or the Tourbillon with sapphire or blue spinel bridges.